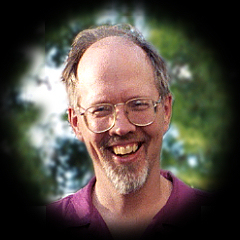 I was born David Harry Schroeder on December 31, 1954, and grew up in Sidney, Ohio. Graduated Sidney High School Class of 1973. Went to Yale. Graduated Class of 1977 in Pierson College. 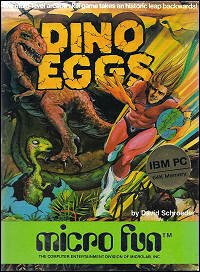 Wrote home computer games in the 1980's, including Crisis Mountain and Dino Eggs. I worked at Microsoft in the early 1990's as program manager for Access and FoxPro. for Windows, Mac OS, and Linux. with many new challenges and puzzles. 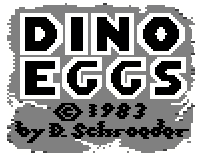 Please visit the new DINO EGGS: REBIRTH website! Help us spread the word about the return of DINO EGGS! -- Watch and share our new videos. -- Join our email list. -- Like our Facebook page. -- Buy the game on Steam or in the Humble Bundle Store ! DINO EGGS (1983) was also known to many as DINO SMURF. 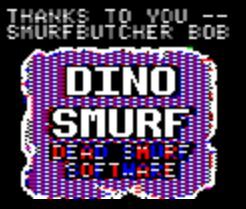 DINO SMURF -- a widely-distributed parody of DINO EGGS (and of course Smurfs) -- was the first part of a planned trilogy of hacked games by Dead Smurf Software (Andrew Johnson and Preston Nevins). Castle Smurfenstein (Castle Wolfenstein) was the second part of the trilogy. In DINO SMURF, Time Master Tim became Smurf Butcher Bob, as he tried to save his children by going back in time and destroying the smurf's prehistoric ancestors (including the now extinct orange smurfs). and HO! HO! HO! Five Family CHRISTMAS GAMES published by Random House. WAR IN MIDDLE EARTH. Aaron Willis is doing a great job in collecting original materials from that game. I also wrote the theater musicals ALKMENA and EXPECTATIONS. I write songs -- including community/humorous and cowboy western. I am married to Margaret D McGee and live in Port Townsend, Washington. I design and maintain websites. My technical resume.